Why this Program >> Concepts. Confidence. Success. Concepts. Confidence. Success. That is our mantra. Studies across the world show that success in mathematics leads to children with high self-esteem. 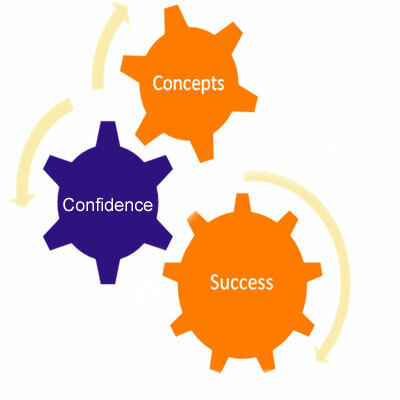 We strongly believe that every child can achieve success in maths through the confidence created by a deep and thorough understanding of concepts. Our unique mix of concept clarification, practice and application sheets, online multiple choice assessment create a holistic learning experience for the child, making him confident and fearless when working with numbers. Concepts + Confidence = No Fear!